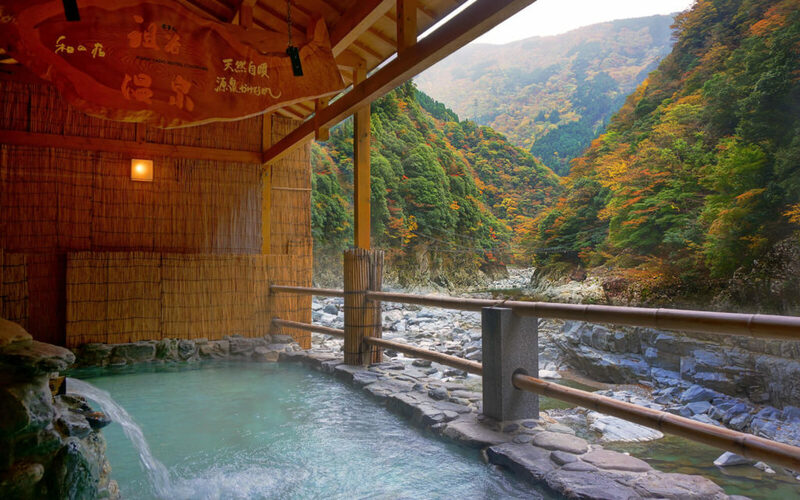 Perched on the jaw-dropping edge of a spectacular valley, Hotel Iya Onsen is one of those bucket-list experiences that I never thought I would actually get to have. 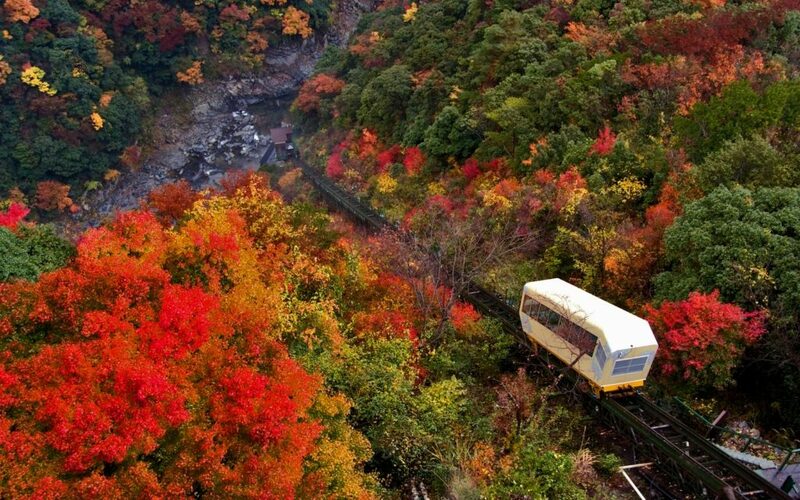 Four years ago I’d seen a picture of a retro cable car plunging into a blaze of red and auburn trees in a dusty “Autumn Scenes of Japan” calendar and had made a promise to one day see it in person. Travels in Japan took me elsewhere, to the obvious must-sees like Kyoto and Mt. 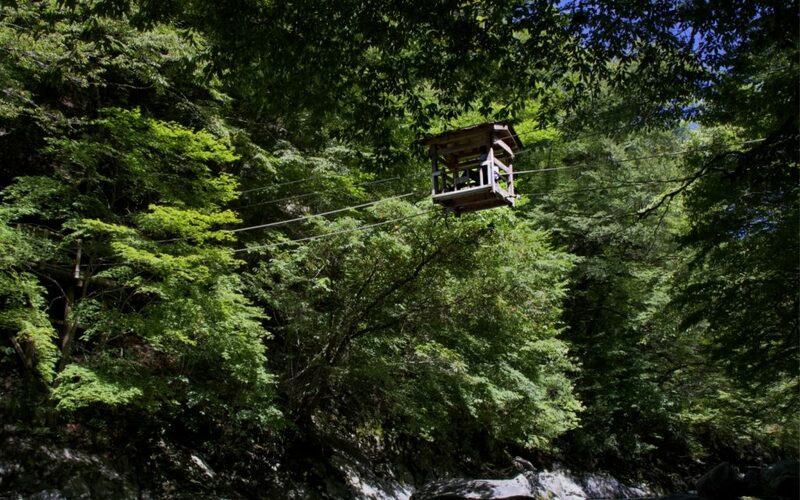 Fuji—places that were much easier to get to than Oku-Iya, deep down in the secluded mountains of Tokushima on the smallest and least populous of Japan’s islands: Shikoku. But when the chance to help promote the hotel to foreign visitors came up, soon after the opening of a new bus service from Takamatsu airport directly to the Iya Valley, it seemed the time had finally come to check it off. An early morning Jetstar flight from Narita had me at Takamatsu’s compact airport in under 90 minutes. I met with my guide from the hotel, Fujikawa-san, who would be taking me across Kagawa Prefecture into Tokushima. As we drove, the view from the window looked like different swatches of green paint melted together. I said as much to Fujikawa-san, who nodded his head apologetically, murmuring, “Yes, there is nothing, only green.” What he was humbly apologizing for — that “green” — was a huge part of the appeal of this region, where endless lime-colored vistas, fairytale thatched-roof cottages and swinging vine bridges tell a different side to the Japan story. 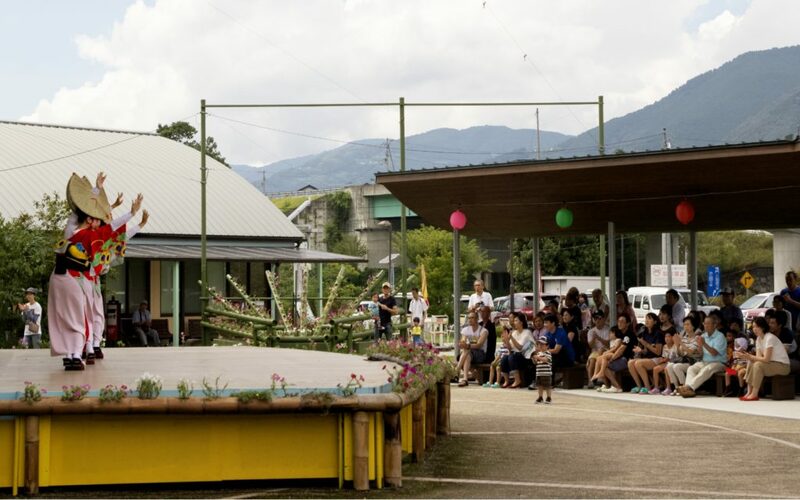 Every Sunday from April to October, people can get a glimpse of Tokushima’s famous Awa Odori festival with a short performance at Yoshinaga Highway Oasis —a highway rest stop in the mountains. In his seminal 1993 book Lost Japan, writer and Japanologist Alex Kerr describes how, blown away by the region’s mystical beauty, he explored over 100 traditional houses — of the many more that had been abandoned — until he settled on a dilapidated thatched-roof property which he then converted into accommodation. 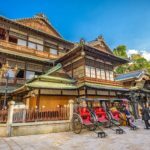 This would be the start of the Chiiori Trust, an NPO that works to restore traditional homes for tourism in order to revive local economies. Kerr is known for being a vocal critic of Japan’s reckless construction style, where the old interests of Bubble-era economic progress vindicate a haphazard bulldozing over historical architecture and natural landscapes. 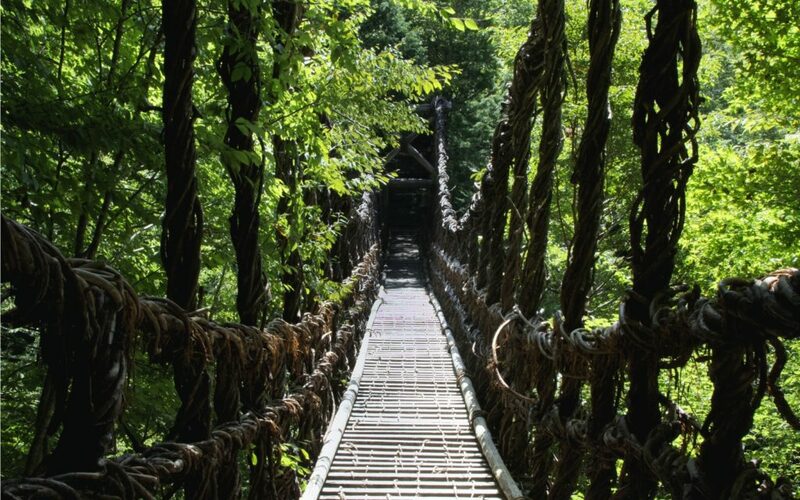 Twenty five years later, the Iya Valley is one of the few places in Japan still largely untouched by development, in part thanks to Kerr’s efforts. As we drove into Miyoshi, the gateway town into the valley, Fujikawa-san pulled into a Lawson’s for supplies. 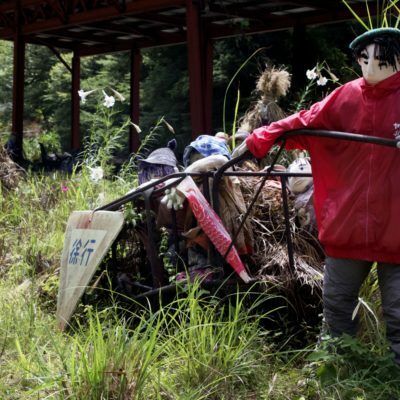 “This is the last konbini for many miles,” he said. Looking ahead as the road narrowed into a tunnel framed by mountains and nothing else, I could believe it. An hour of winding along mountain roads later, we arrived at Kazurabashi. 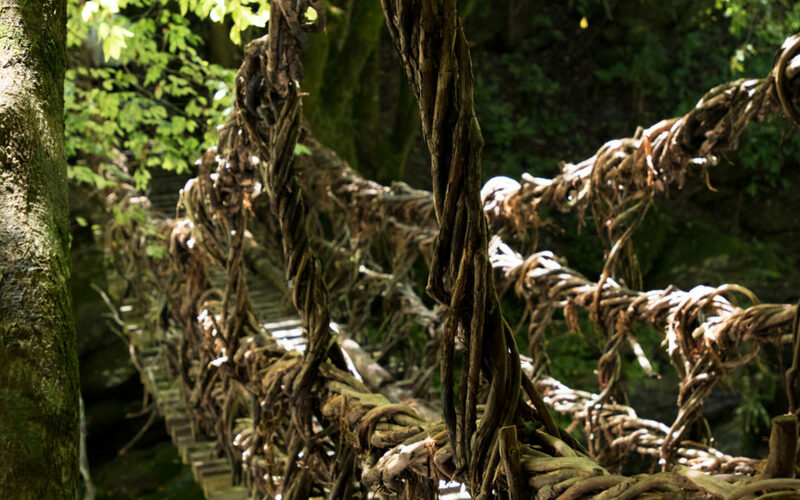 This is the most famous of the Iya Valley suspension bridges, twisting structures made of mountain vines that were said to have been built by Heike samurai who had taken up refuge in the isolated valley after a defeat. The bridges were used to move across the river but could be easily cut away if anybody came looking. 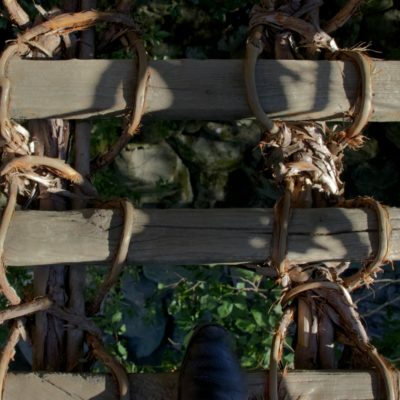 Of the original 13 bridges, only three can be seen today. 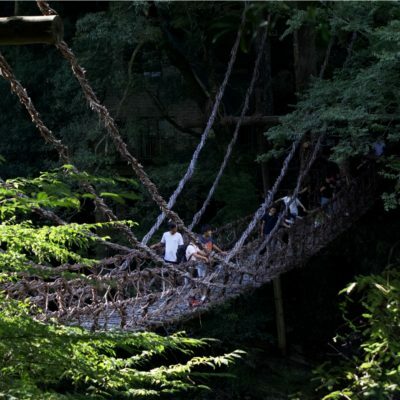 Visitors pay a small fee (¥550) to cross the bridge which swings precariously from two cedar trees at each end. Huge person-sized gaps separated the vines on the bridge floor, giving a clear view of the rushing river below and making the small handful of tourists yelp in unison whenever one of us took a step. 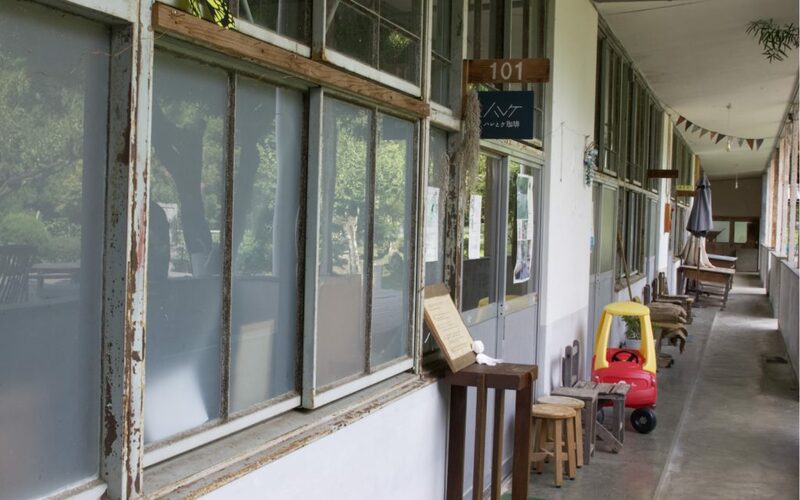 Driving deeper into the valley, Fujikawa-san made a sharp turn into a narrow path that led to an elementary school. It was eery in its abandoned state, save for a group of old women in the schoolyard who pointed up the stairs where, incredibly, there was a cafe. 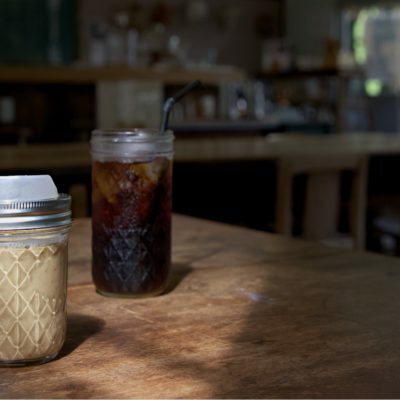 Built inside one of the old classrooms, all the elements of the former elementary school were hauntingly preserved, though the chalkboard displayed the menu while desks at the front were stacked with coffee siphons. 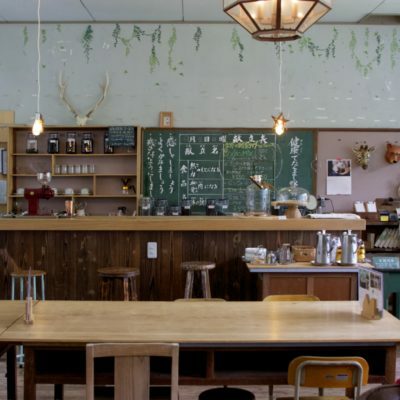 The cafe, called Haretoke, is owned by Uemoto-san, a designer who moved from Tokyo to Iya to start a local design office. He’s also behind Haretoke design hostel upstairs. 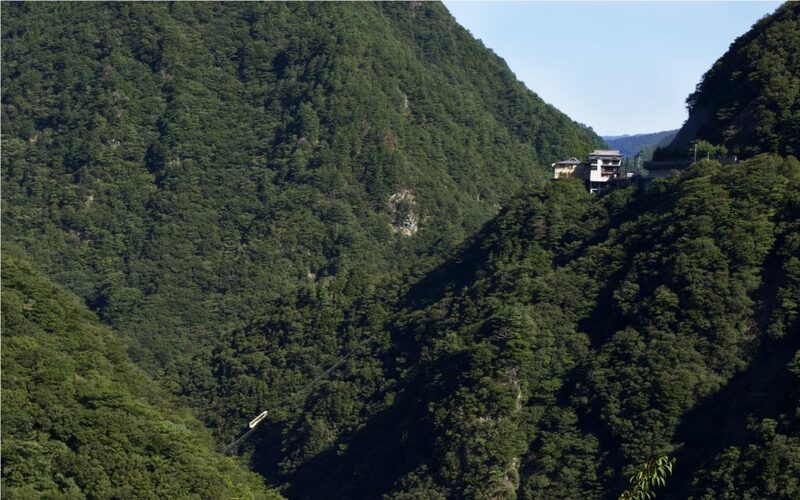 A short way past the elementary school, I saw my first glimpse of Hotel Iya Onsen, a square anomaly wedged into the mountainside. We stopped to take a photo of the Peeing Boy statue, Tokushima version of Brussels’ famous Manneken Pis, except this time the statue overlooks a vertiginous ravine. 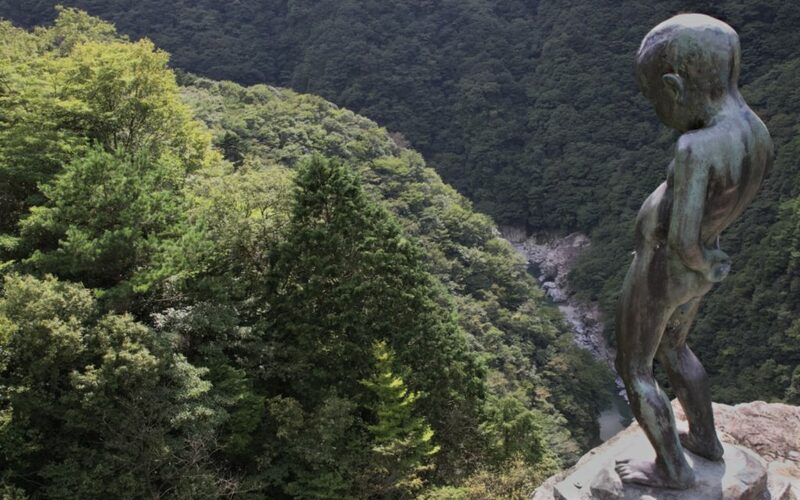 Fujikawa-san tells me that the statue was built to stop local boys from daring each other to pee into the river from this spot — as if the sharp drop wasn’t enough of a deterrent. 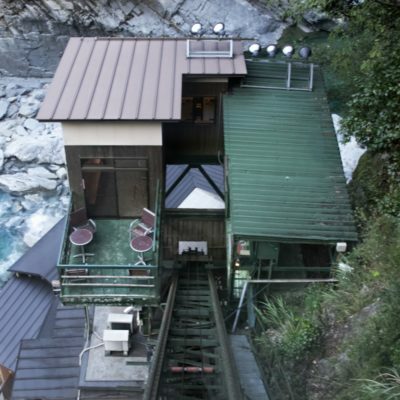 In spite of its remote location, the lobby of Hotel Iya Onsen was bustling. 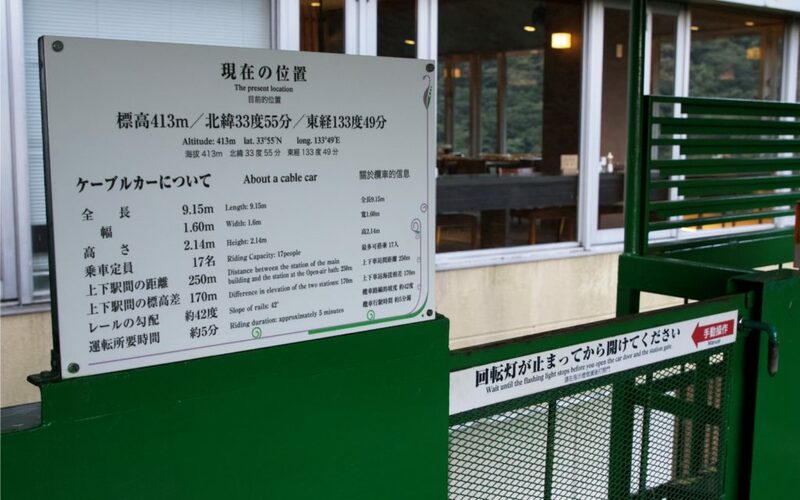 Guests in yukata (light cotton kimono) shuffled excitedly to the entrance to the famous cable car, which would transport them down to the riverside rotenburo (outdoor baths), while staff were busy with preparing the dining hall for the evening’s dinner. 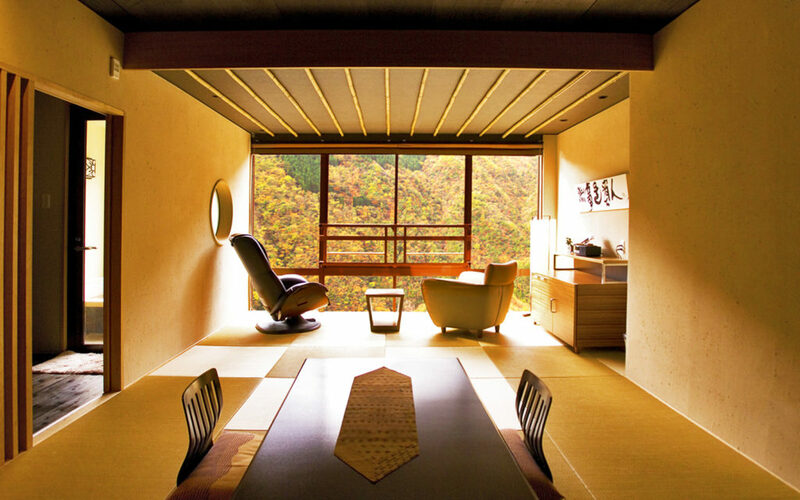 Hotel Iya Onsen has several different types of guest rooms but all come with an epic view. I checked into my elegant room, which had a large porthole looking right out onto the steel framework of the cable car, painted dark green to match the sprawling forested valley that rolled out like a mossy carpet beyond it. But there was no time to waste, I needed a bath. 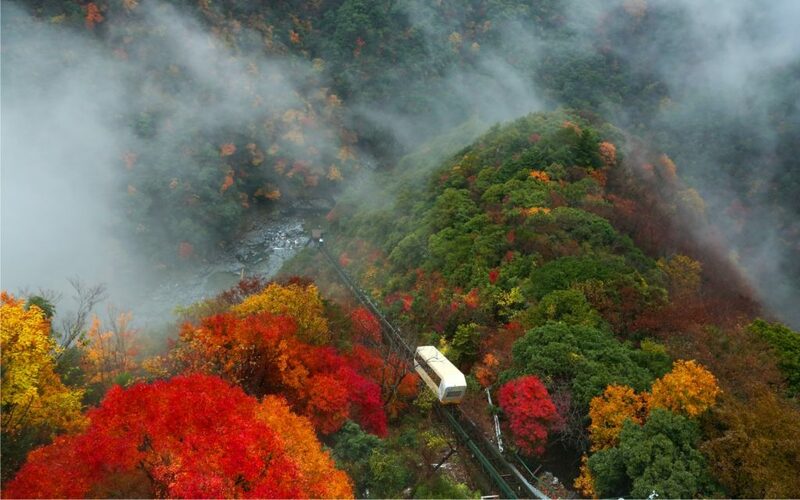 The cable car in autumn. 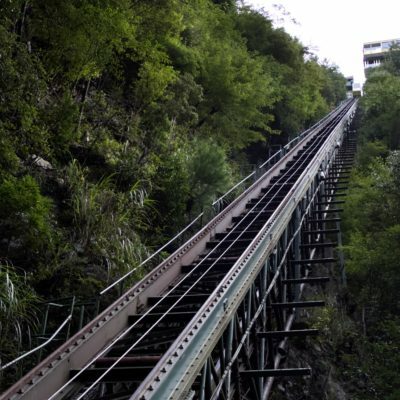 Though the hotel opened in 1972 the first cable car wasn’t built until 1984 so guests had to make the 30-minute climb down when they wanted to take a bath. Being in the line for the cable car felt the same as queing for a rollercoaster ride, with the peculiar feeling of being somewhere very high up, about to go very far down. An alarm signalled that the cable car had arrived and a handful of us in yukata, towels on our head, climbed in. After the door shut, it hung above the valley frozen for a moment. 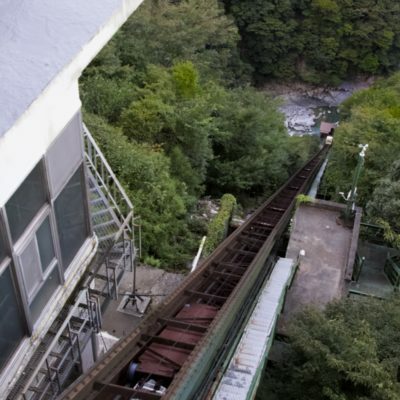 Then metal clicked, wheels whirred and the cable car started its rusty 170-meter descent. The rotenburo are accessed via a tunnelled wooden stairway that leads from the cable car exit even further down into the valley. There are two baths; Keikoku-no-yu and Seseragi-no-yu, alternated daily for men and women. 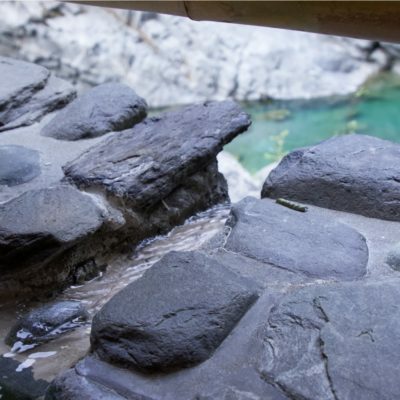 Soft, alkaline water flows straight from the hot spring source over the bath’s edge into the river below, giving the baths a slightly fizzy quality. The constant flow of fresh hot spring water also means that bathers, contrary to tradition, don’t have to wash before they enter. Dragging myself away from the bath was a challenge but the promise of a locally sourced multi-course kaiseki helped. Served in the hotel’s wide-windowed dining room, which juts out over the edge of the mountainside, the two-hour course was a showcase of seasonal delicacies from the river I’d just been gazing at, as well as rustic local specialities like the Iya soba, handmade with all-natural soba flour, and Iwa dofu or “stone tofu,” made dense enough that once upon a time local people could carry it across the rocky landscape with a piece of rope. Served in a dining room above the clouds, breakfast and dinner are equally spectacular. The next day after breakfast above the clouds, we visited the two remaining vine bridges, which being more difficult to access were almost completely free of tourists that day. 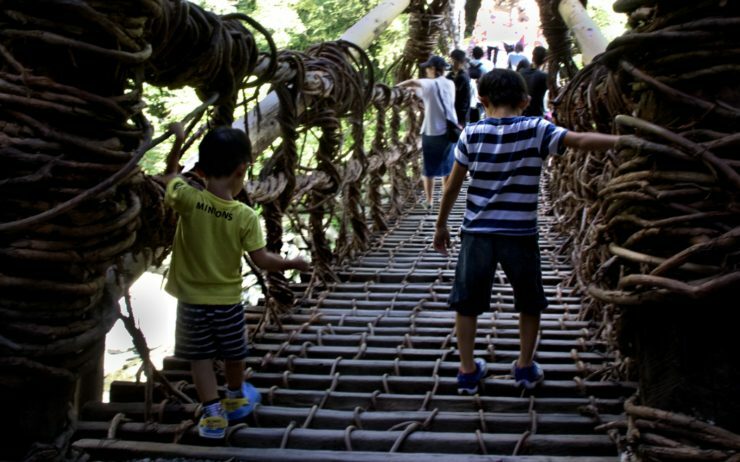 Oku-Iya or Inner Iya is home to the “Otoko Bashi” (husband bridge) and “Onna Bashi” (wife bridge), as well as a “Monkey” bridge, where a wooden cart suspended from cables was formerly used to transport goods across the river. Now you can actually climb in the cart and try to pull yourself along. This part of Iya felt even more otherworldly than what we’d seen yesterday — a feeling that came to a head when, on our way back, we passed through Kakashi no Sato, or Scarecrow Village. 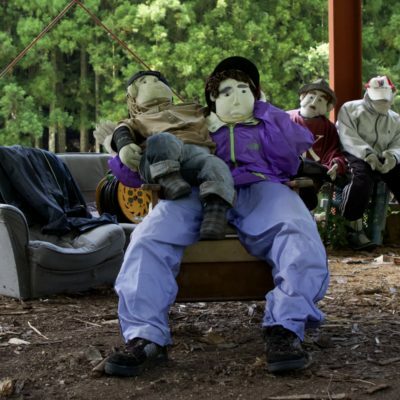 Here, in a sunny hamlet in the middle of the mountains, a population of scarecrow dolls took up residence in the abandoned post office, bus stops and empty houses. 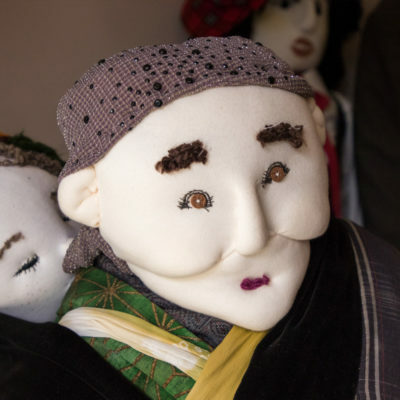 Again it was just me and Fujikawa-san, though Kakashi no Sato is somewhat internet famous after the story of Ayano Tsukimi, who began sewing these dolls as a way to stave off loneliness in her dying village, went viral. 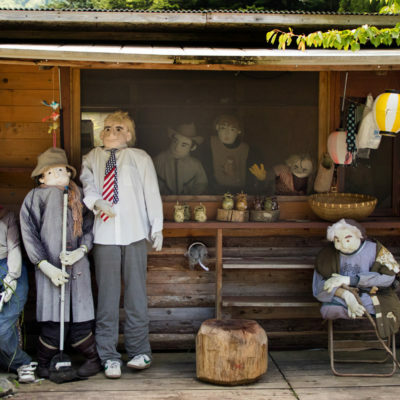 There are just a few human residents left but more than 400 scarecrows, including a visiting President Trump. The irony wasn’t lost on either of us. 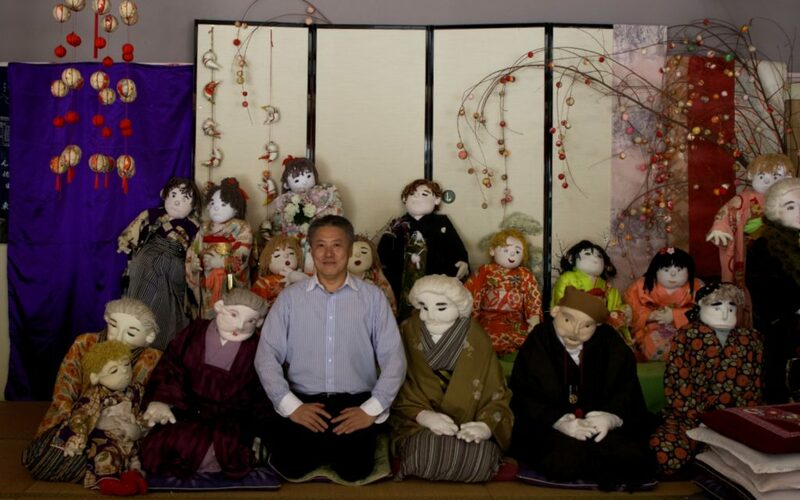 Fujikawa-san with his new friends. From the outside, the lost Iya Valley might look weatherbeaten from years of depopulation, a neglected region where the old ways of rural life were slipping through its coarse fingers. 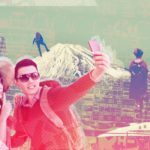 With the recent boom in tourism, it sometimes does feel that Japan is creeping towards the edge of losing itself. But after just two days exploring it was clear that in many ways Iya was, in fact, thriving. In everything, the glorious, almost transcendent rural landscape, the traditional architecture, the food, folklore, and the people, there was a sense of determined timelessness, a sort of resolute adapting while staying faithful to its essence — an essence that ultimately deserves to be found. 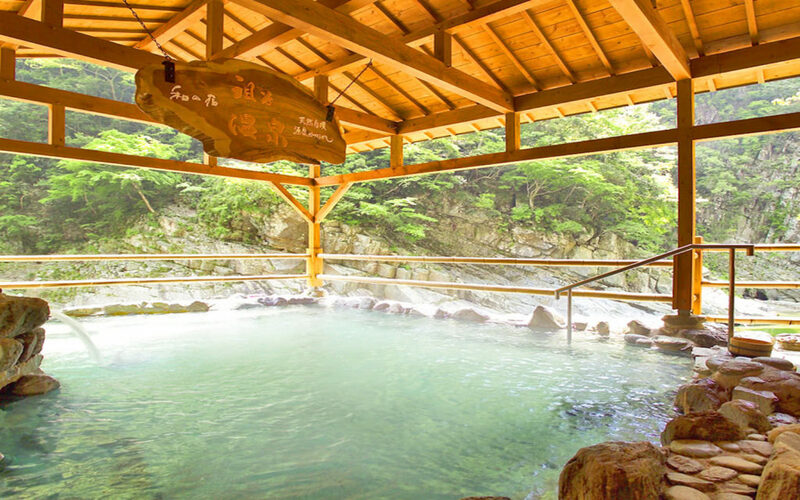 Hotel Iya Onsen is open for both day visits and overnight stays. They offer rooms by “plan,” with discounts for bookings more than a month in advance. 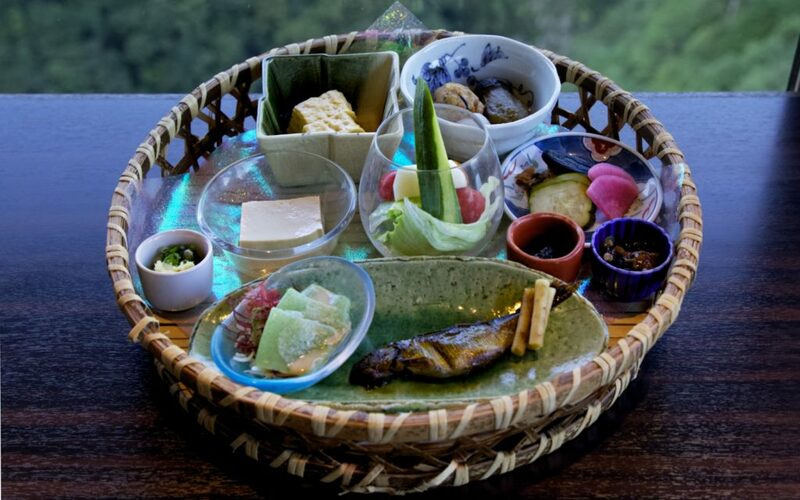 Each plan is decided by the evening kaiseki meal you choose, after which you can choose between Japanese and western-style rooms, and those with a private bath or outdoor terrace. 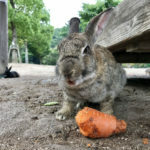 Eager to welcome more diverse visitors, the hotel has several bilingual staff and is LGBTQ-friendly (you may have spotted them handing out pamphlets at this year’s Tokyo Rainbow Pride). The hotel has a comprehensive English website (see below), through which you can make bookings, send enquiries and find out more. 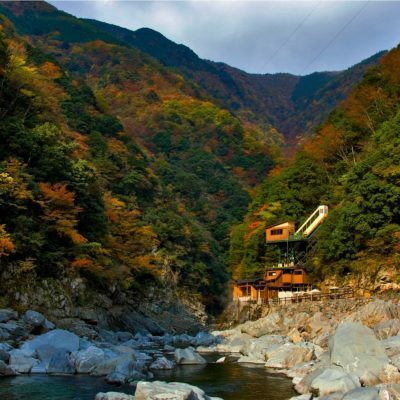 Check out their Instagram @hotel_iyaonsen run by Fujikawa-san, who’s also a keen photographer! 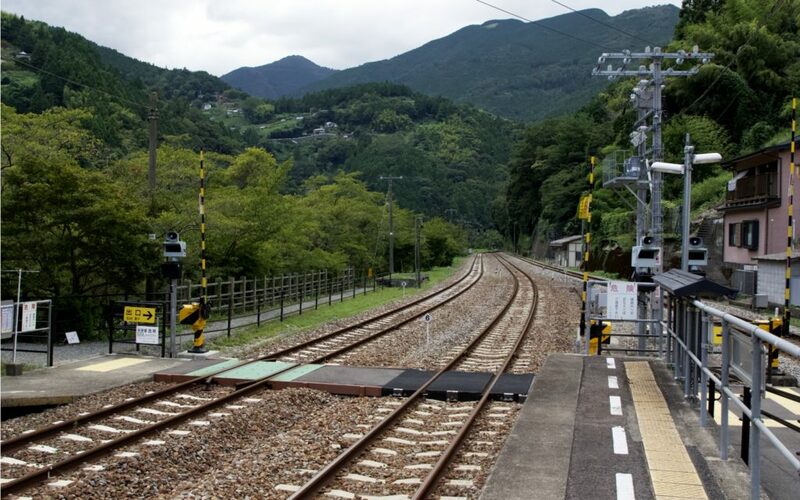 JR Oboke Station is the closest train station to Hotel Iya Onsen. 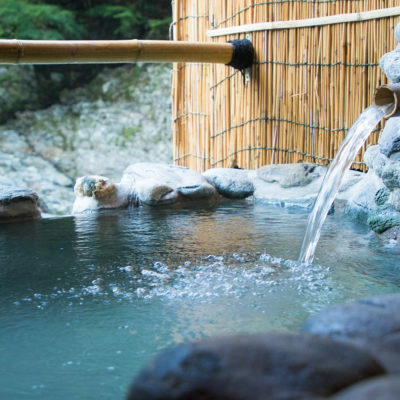 Hotel Iya Onsen offers pick-up for overnight guests from JR Oboke Station once a day —check with them at the link below for details. 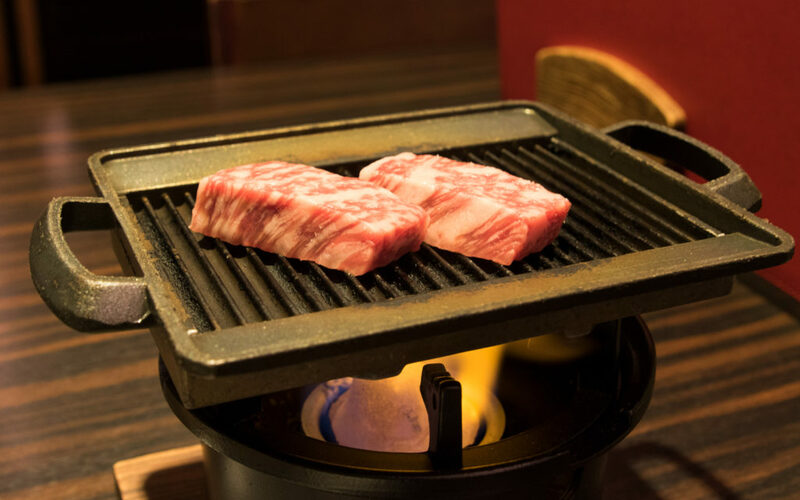 The website has comprehensive access information to Iya from central Osaka, Kobe and Okayama, as well as Kansai International airport and Takamatsu airports. Note that Tokushima’s airport is not a good option for getting to Iya even though it’s in the same prefecture. The Koto Bus sightseeing service opened in July and provides direct transport from Takamatsu airport to Iya, stopping at sightseeing spots along the way. Information can be found here. Better stock up on stamps. 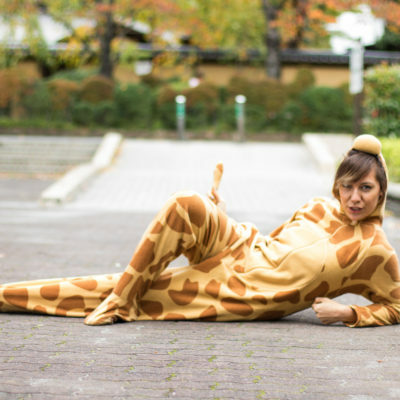 Four fantastic locations in Japan where you can get up close and personal with animals in their natural habitat.